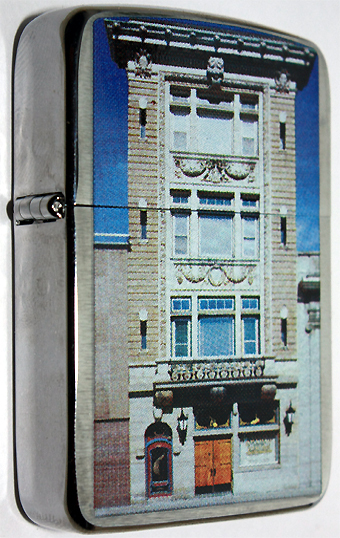 On location in Bradford, Pennsylvania in July, 2009 on our first trip to the hometown of Zippo lighters. The year 2008 was one of transformation for The Option House at 41 Main St. This magnificent structure which began as a small wooden building in 1881 for the daily trading of oil options has been a Bradford landmark for over one hundred years. The historical gem was recently purchased and restored by Sam Sylvester for the people of Bradford. Sam had the vision to look past the building’s crumbling interior to see the possibility of bringing back The Option House to its former glory in the community, and he has accomplished just that. In April 2008, a dedicated crew under the direction of master restorer Rick DeLong began the process. From local bankers to contractors, painters, electricians, plumbers, carpenters, carpet layers, artists and craftsmen, good and talented workers joined the team. For months and months the tremendous undertaking of restoring the old and badly-neglected structure to the charm and elegance of the 1930’s proceeded. Every inch of it, including twenty apartments, bar and restaurant, banquet room, kitchen, cellar, and windows needed attention. 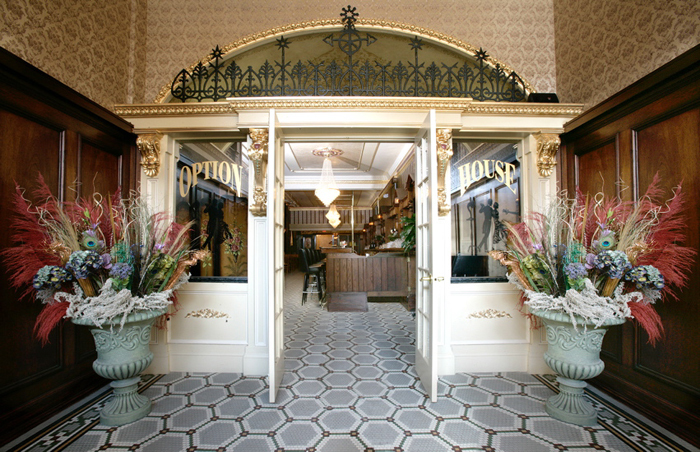 The process of repairing, cleaning, painting, and restoring is now complete, and The Option House has opened its doors (restored to emulate the originals). Much of this work was performed by Paint My World and you can see before and after photos of the process. Following the discovery of oil in 1859, the original Option House opened in the early 1880’s next door to the first Bradford Oil Exchange. The oil traders gave the new establishment its name, as they traded oil---five million barrels daily in those boom years---in “option” contracts. The Oil Exchange is gone, but The Option House remains. 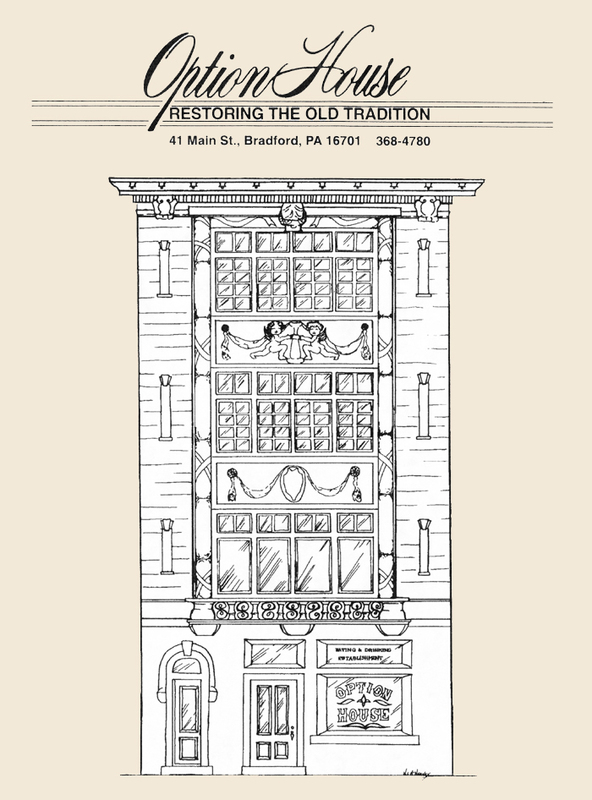 In 1902 the McBrides, owners and proprietors, tore down the wooden frame Option House and built a modern, fireproof, four-story establishment of the same name on the same site. Construction began August 2, 1902 and was completed incredibly by mid-October 1902!! This magnificent rococo-style building still stands today serving as a 20-room hotel, restaurant, bar and banquet room. The new building was designed and built by architect Frederick French with an exterior façade in rococo style featuring ornate decorations of garlands, cherubs, and stone tablets called cartouches. Inside were neo-classical touches such as wood-carved Ionic columns and egg-and-dart patterned ceiling molding. People compared it favorably to Bradford’s other fine hotels like the Pierce House and the St. James. The Pierce and the St. James are memories, but the beautiful architecture of The Option House remains. The Prohibition Amendment was passed in 1919 and went into effect in 1920. People who wanted a drink with their fine Option House food now had to turn to bathtub distillation or buy bootleg liquor of questionable quality. Good bonded liquor, bottled in other countries, was smuggled into the United States. It was said to be “just off the boat”. Most of the liquor available, however, tasted as though it had been scraped off a boat. 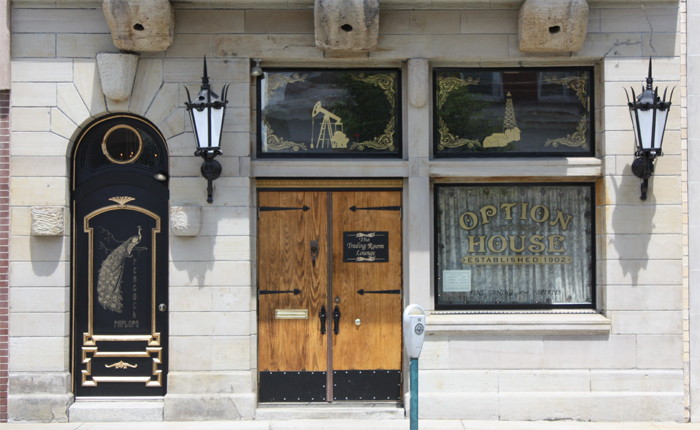 While prohibition ended in 1933, the tradition of fine food and drink at The Option House remains. In years past business men have stood in The Option House along the long, long bar installed by Brunswick, Balke & Callendar waiting for the streetcar on Main Street. The last streetcar ran on September 29, 1929. 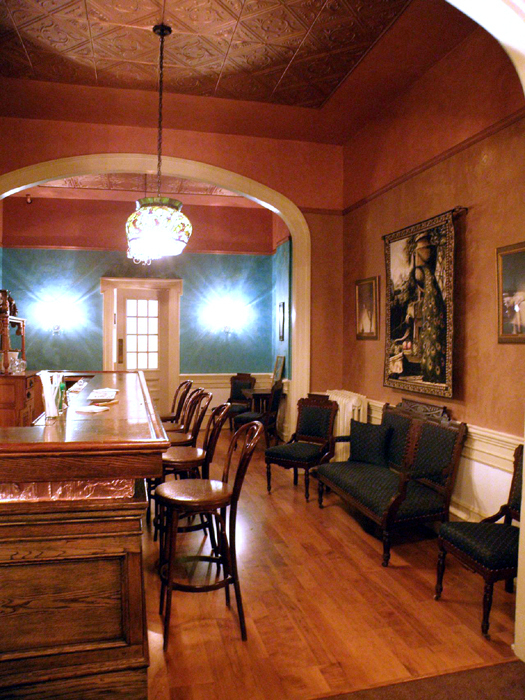 The long, long bar at The Option House remains. Over the years Bradfordians have witnessed a lot of changes. People, businesses and buildings have come and gone. The country’s economy has gone up and down as did the human fly who once climbed the front of The Option House. Visitors are greeted immediately by a beautiful period-designed vestibule, wallpaper, faux painting, and gold stenciling which now covers the once nicotine-stained walls. Softly polished wood has emerged to give beauty to the bar and restaurant walls, and elegant crystal chandeliers provide glowing light throughout the downstairs area. The visitors have two lovely new restaurants to enjoy. Their décor was inspired by 1937 newspaper articles given to Sam By Alan Gordon. The articles describe the appearance of the restaurants under the ownership of Jimmy Rich. 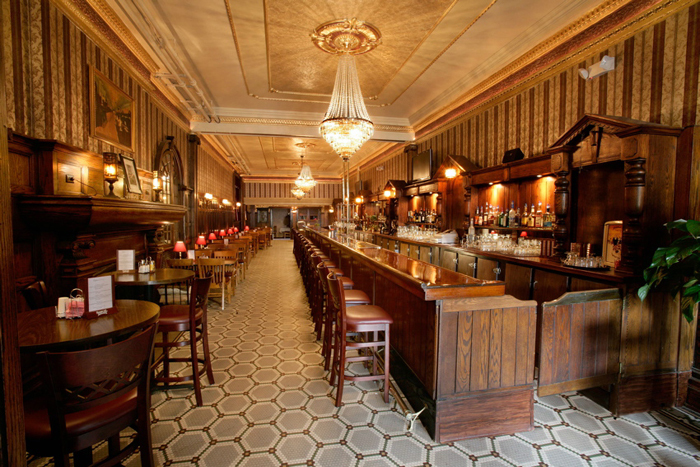 In 1935, he installed the long Flemish oak two-ton Brunswick bar lighted with old English lanterns which still grace the then christened “Chateau Bar” and “Cabaret Restaurant“. It is now called “Trading Room Lounge“. The opposite wall, the centerpiece of which is a stunning fireplace, is adorned with four original wall sconces. The hexagonal tiled floor and the oak wainscoting are original, as well. In 1937, Jimmy Rich expanded the building by adding thirteen rooms to the rear and opening a nightclub called “Peacock Alley” on the second floor. He fashioned his nightclub after the famous “Peacock Alley” restaurant at the Waldorf-Astoria in New York City. Each section, or parlor, was painted to match the colors of the large peacock which was hand painted on the room’s focus wall. “Peacock Alley” featured three nightly floor shows six nights a week and dancing for the entertainment of its guests. 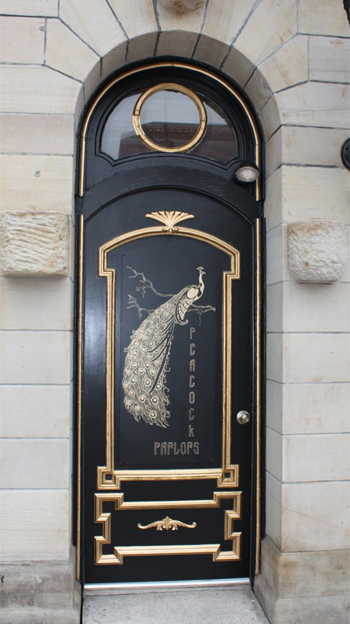 Today’s “Peacock Alley”, now known as “Peacock Parlors”, has been restored in great detail to emulate the 1937 restaurant. The peacock wall painting previously there is now one which has been laser printed onto tiles. The walls of the parlors match the colors originally used and elegant peacock-colored Tiffany light fixtures add to the room’s ambiance. Guests will take the grand marble and carpet staircase through the gilded gold arch into “Peacock Parlors”. A chair lift to the second floor restaurant has been installed at the front entrance stairway. “Peacock Parlors” serves as a formal dining room for individual diners and special events functions. Its elegance is unsurpassed in the region. “Peacock Parlors” serves as a facility for individual dining, banquets, receptions, business meetings and other special events. The dining room,including the intimate bar area, seats 60-70 people. Separate parlors in the dining room may be sectioned off for privacy. Guests take the grand marble and carpeted staircase (chairlift access provided) from the first floor entrance and enter the gilded gold arch door into “Peacock Parlors”. 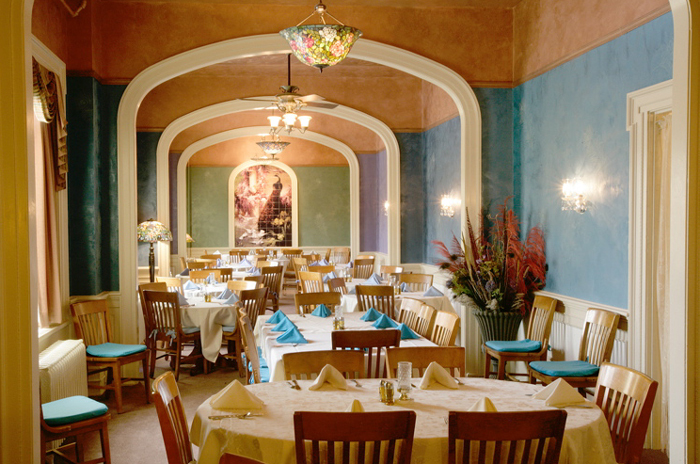 The elegant Peacock Parlors dining room at The Option House is available for banquets, meetings, receptions and other special events. This fine dining facility can accommodate approximately 60 guests in its beautiful surroundings enhanced by the rich colors and fabrics reminiscent of the 1930’s which make up the décor. For smaller groups scheduled simultaneously, portable room dividers give the perception of privacy to each gathering’s event. Tapas hors d’oeuvres, lunch, and dinner selections are offered and buffet or tableside service may be chosen for the occasion. A small, intimate private bar serves cocktails and features an extensive wine list of selected wines by the glass or by the bottle, and the area’s finest companions of brandies, cognacs, and armagnacs. 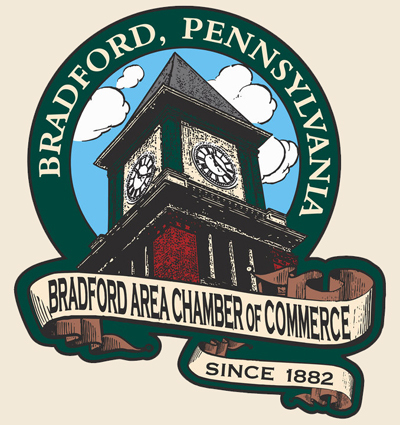 On April 8, 2010, the first Bradford Area Chamber of Commerce Exemplary Business Award was presented to Sam Sylvester, owner of The Option House since 2008. This award goes to a for-profit business that demonstrates a well-planned, thorough and serious approach to business development and exemplifies the unique "hometown" charm of the area in matters of administration, customer service and quality of product. 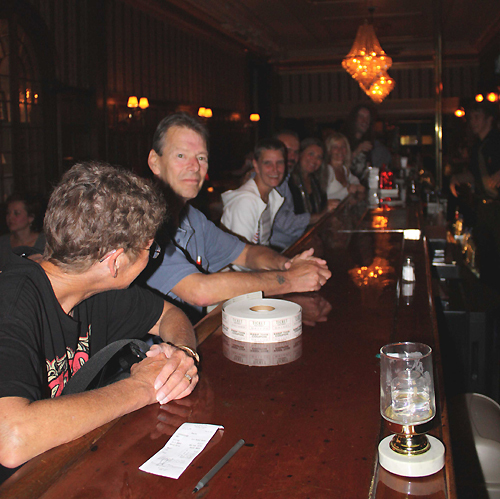 On July 17, 2009 after the ZEN Dinner at Kelly's restaurant & bar on 27 Main Street we went for a drink to the Option House. We sat down at the long Flemish oak two-ton Brunswick bar from 1935 lighted with old English lanterns. We, that were Robin & Dana, Petra & me, Claudio & Antonella, Melanie & Mike. Two days before we had dinner upstairs at the Peacock Parlor with Mike & Melanie. Sam came to our table telling us about what he calls "his lady". So if you ever happen to be in Bradford the Option House definitively is the place you would not want to miss! 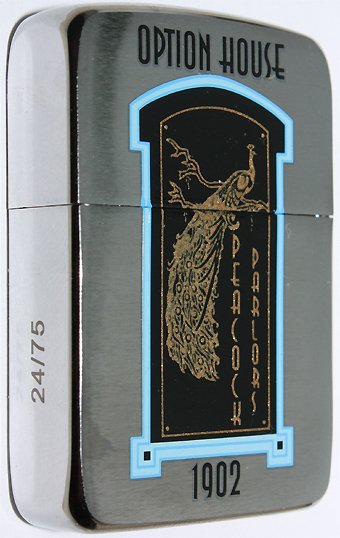 of only 75 Zippo lighters.